Tajikistan has begun supplying Uzbekistan with electricity, Tajik media reported this week. According to RFE/RL’s Tajik Service, locally known as Radio Ozodi, after a nine-year interruption, the energy trade across the Tajik-Uzbek border has resumed. Specifically, Tajikistan has begun supplying Uzbekistan with electricity via a power line running from the Regar substation, near the city of Tursunzoda west of Dushanbe, to the Gulcha substation across the border in Uzbekistan. 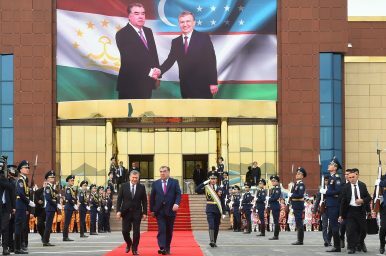 The resumption of the energy trade between the two countries is the result of more than a year of concerted diplomacy spearheaded by Uzbek President Shavkat Mirziyoyev. In February, the head of the Tajik state-run power company Barki Tojik, Mirzo Ismoilzoda, said that Tajikistan would export 1.5 billion kilowatt hours (kWh) of electricity to Uzbekistan from April through September. At the time, Eurasianet reported that the pricing had yet to be worked out. Asia Plus reported this week that Uzbekistan will pay 2 cents per kWh of electricity, about half the price paid by Afghanistan in 2017, for the summer months. Last year, Tajikistan reportedly supplied Afghanistan with 1.3 billion kWh of electricity. The sides, it appears, are considering electricity trades in the winter as well. However, in winter, Tajikistan traditionally needs to import electricity. Barki Tojik officials told Eurasianet in February that an agreement on resurrecting Central Asia’s Soviet-era unified power grid had been reached but the technical details were still being hammered out. Uzbekistan withdrew from the grid in 2009, effectively shutting it down and preventing Tajikistan from exporting electricity to countries like Turkmenistan and Kazakhstan with which it does not share borders. The reverse was true as well, with Uzbekistan impeding the import of electricity via its territory. With few resources, Tajikistan has sought to capitalize on its geography to generate hydropower for both domestic consumption and export. The resurrection of the unified energy grid will be a boon to Dushanbe. The pieces certainly seem to be falling into place for the resurrection of the unified power grid. The next steps, it would seem, lie in Uzbekistan’s allowance of its territory and infrastructure to be used by its neighbors to swap electricity among themselves.